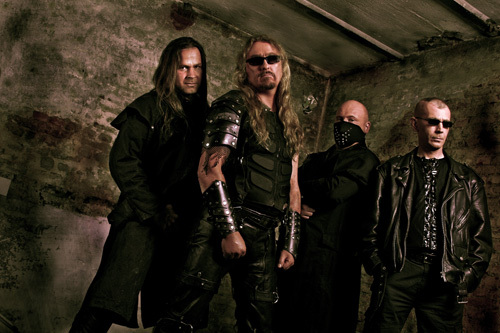 Straight out of the "where have they been all these years" file is German power metal band Stormage. They haven't dropped a new studio album in ten years. Although that's not surprising for some bands, what is remarkable is that Stormage returns with same personnel from its inception in 2003. The new album is Dead Of Night on the Massacre Records label. Having never heard a Stormage album, I have no point of reference nor any preconceptions of what to think of them. But when they're said to be a heavy power metal band, and from Germany, certain expectations come to mind. 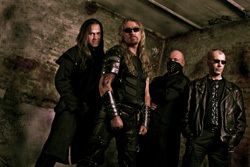 The consistent and constant elements of the power metal genre are here. There's twin guitar harmony in the riffage and, naturally, an abundant amount of screaming guitar solos. A powerful rhythm section with a strong bass line and double bass drumming keeps the pace from steady to pummeling, as necessary. Heiko Heseler offers traditional metal vocals, singing clean, soaring at times, but mostly controlled. His vocals are often matched with some gang vocal arrangements from the rest of the band. The songs vary in tempo, yet still offer the proper balance of metal heaviness with melody and groove. There are some pure power metal songs, with beefy heaviness and a raging pace, with Instinct To Defend, Anguish Of Mind, Drag You To Hell, and Borne The Agony. Alternatively, songs such as Faithless God and In The Line Of Fire moderate or mix the tempo within the song. The latter song is a good example of where Stormage uses both melody and harmony in the refrain to create a catchy hook. Something of a heavy metal anthem comes with Victims Eyes, which leads with piano and then continues with an abundance of riffage, strong bass line, powerful vocal arrangement, and delivers a sizzling solo. But the real gem here is the song Prime Of Life, another heavy metal anthem. It leads with both acoustic guitar and light electric with Heseler giving a passionate vocal performance over them. Riffage eventually ascends and, backed by powerful drumming, leads to an exquisite catchy chorus. After a guitar solo and another round of the chorus, the songs ends with a children's choir. Definitely the pick of the litter. 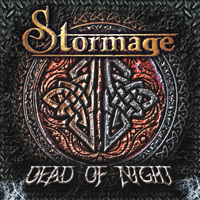 Suffice to say, Dead Of Night is a strong return to form for Germany's Stormage. The album is power metal as it should be and everything you love about the genre. Hopefully, we won't have to wait another ten years for the next album. Recommended.